The Metric Summary provides an overview of all of the available metrics, delivered daily, weekly or monthly. Instant notifications are great for events that you want to act on right away, like downgrades and cancelations. 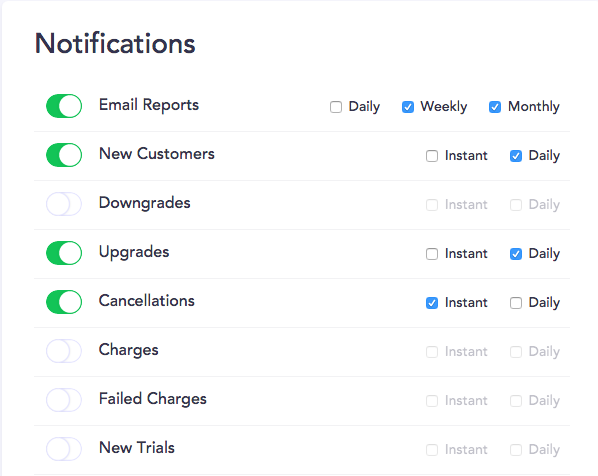 Daily Notifications are better suited for things you don't need to be updated on right away. Choose wisely–or choose both! 1. Hover over your picture at the top right and choose Notifications. 2. Turn on your favorites!